Days: 4 Days/ 3 Nights. Max altitude reach: 3700 m.
Age limit: 12 years old. Minors must be accompanied by an adult or legal guardian. 12:00 PM – Meeting at bus station in San Rafael. At 13:00 hs after having met and coordinated everything we went to the mountain shelter, place of our first camp. Consider that this program does not include transportation from San Rafael to the Mountain shelter. Another possibility is go with your vehicle directly. At the shelter we will inform about the details of the following days. Dinner. We have breakfast, we deliver the lunchbox and we begin the horse back riding. We will cross Atuel, Rosado and Barroso rivers. After 5 – 6 hours we arrive to the Camp Barroso at 2,550 meters of altitud. Moving our stuff with mules, we set up our camp setting the tents. We will have a nice sight of Mt. Sosneado, 5,200 meters, to the northeast. Late afternoon we have dinner. At morning we have breakfast, deliver the lunch boxes and then we start trekking to the Valley of Tears. After noon we will reach the “Las Lágrimas Glacier”, reaching 3,600 meters, on the border between Argentina and Chile. We will ascend to the Memory Cross to pay our respectful homage to the victims. Then we will walk around the area making a reconnaissance of the place, where we can observe the fuselage of the Fairchild plane, dozens of crosses, epitaphs, flags, offerings, and the monument to the victims. We will share details and anecdotes about this unforgettable story. Upon returning to our base camp we will make a good half-afternoon and enjoy the place until dinner time. We have breakfast as we dismantle our camp and start our return. Upon arrival at the Sosneado station, we will have lunch and then travel to the city of San Rafael, ending our services and grateful to have enjoyed this trip together. Kitchen items. No personal utensils. Support of Mules for ascent and return. They carry all the common equipment (tents, kitchen elements, heaters, fuel, meals, etc.) and 5kg per pax of personal equipment. Support of horses for crossing of rivers (Both Modalities). You are responsible for the following items. Rescue expenses or other costs due to abandonment of the expedition. Any other service that has not been specified as included in the previous pages of this document. The expedition difficulty level is “moderate”. The itinerary can be perform by beginners as well as by seniors. The trekking takes place in remote areas, far away from the city in the middle of the Andes range. That is why we recommend a medical checkup before the trip. During the season, the weather is usually mild with high temperatures during the day and lower during the night. However, as we know, weather in the mountain can change abruptly as well as the wind speed. Before leaving, we’ll check your equipment to make us sure that you have everything ok. That is why, it’s better to bring more gear and what it’s not necessary, we can leave it at the mountain shelter. In case that you need some equipment, there are rental shops where you can get it. The guides and local assistants will help you with your equipment to carry. However, we recommend taking a little backpack for personal stuff like sunglasses, hats, etc. Hip pouches are very useful for carrying personal stuffs. We have the right to modify the schedule in case of weather adversity, operational issues or any other problem beyond our responsibility. We also have the right to keep outside from the program any person whose health condition is not appropriate for the activities to be carried. The return to the San Rafael is near to 7 pm. You have to take into account when getting the return ticket in case you are travelling that same day. You can also ask for a night at hotel in San Rafael. Comfortable waterproof trainers. If you’re used to wear riding boots, you can bring them. We don’t recommend big shoes since they’re difficult to put in the stirrups. An extra pair of shoes to rest at camp. Socks. ( 1 warm pair) We recommend long socks in order to protect us from the rubbing. Rain Parka with hood. (gore-tex. ultrex). Loose pants. (similar to “Gaucho’s” pants). Don’t wear jeans or removable pants with zippers. Sunglasses (with UV filter and side shields)Cantimplora o similar de 1 litro mínimo de capacidad. Headlamp with set of extra batteries. *In case you don’t have some elements, please ask us. In order to enter the Valley of Tears it is necessary to obtain an Entry Permit, cause it is located on private lands belonging to Las Leñas S.A. The permit is included in the program. Join this expeditions led by one of the most qualified guides in Argentina. 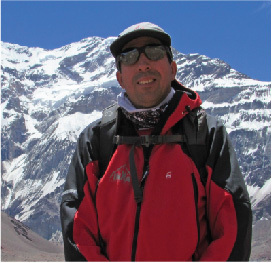 Heber Orona is the first and only Argentine to do the 7 Summits. It was also the first Argentine to reach the summit of Mount Everest without oxygen or porters assistance.